So I'm pretty much laid up and having my own little film festival over here and just watched a great one that I need to recommend. 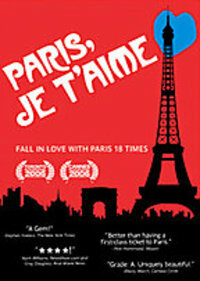 Paris Je'Taime is a collection of 18 five minute films all based in my favorite city. Some are sad, some are funny and some are intense. There's my film review for you. Go rent this film. It captures the city pretty well in my opinion.....and it'll put a tear in your eye.